Topic-linked pairs of engaging character stories and compelling non-fiction books at Level 9. Perfect for deepening reading comprehension. 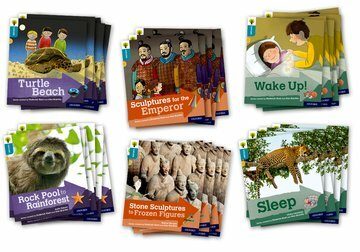 This pack contains 36 books, six copies of each of: Sculptures for the Emperor, Stone Sculptures to Frozen Figures, Wake Up!, Sleep, Turtle Beach, Rock Pool to Rainforest.